There are so many frugal ways to save money out there. Are you looking for something that you can change in your life that is small but won’t drastically change your life? Maybe changing several small things in your life can be good because in the end it can lead to bigger savings! “Every little thing counts” is what I always say! Now, I’m not the type of person who likes to cut everything out. However, making one change now (or every now and then) can lead to long-term savings. I do like to splurge every now and then (hey, I just bought a brand new Camaro 2SS, so I’m the definitely of splurge in the personal finance community probably), but I still like to save money on the little things as often as I can. Most companies will give something if you ask. It might just be $5 a month, but that is something! Ask if they will match their competitors rates or even if they could just shed a couple of dollars from your monthly bill. I recently called my satellite radio company and told them I wanted to cancel. I NEVER use it and haven’t used it in months (there’s nothing ever good on it). I figured I’d rather save that $17 a month. When I called, they offered to give me an additional 2 months free, and that if I wasn’t happy in May, then I can just cancel again with no fee. Yup, I took it! So, for about 10 minutes of your time, you can save a decent amount of money by just asking. Asking never hurt anyone! Even if they say no, I’m sure at least one company will say yes to your offer. I bring my lunch to work almost every single day. I actually prefer not having to leave my work to get food (there is nothing within walking distance). So I get to save money by bringing food from home, and I get to save gas money because I don’t have to leave my office as well. I do go out to eat maybe once every week or once every 2 weeks. Every now and then I do like to escape the office. Turn off the lights in rooms that you are not in, and also unplug things you are not using. This may not add up to a lot of savings, but it is something. Maybe $20 per month! There is no need to keep things plugged in or turned on when you are not using them. Even if it’s plugged in and you are not using it (such as a computer’s charger), it is still sucking up valuable electricity. Do you really need that gym membership? We just bought a full home gym and treadmill. It was expensive, but it’ll pay itself off in just 2 years of what we would have paid for gym membership fees for the two of us. Now, we definitely see value in this! However, you could also just work out at home and not buy all of this equipment. You could do more natural workouts such as push ups, sit ups, running outside and more. No need to pay $100 or even $30 a month on a gym if you don’t want to. 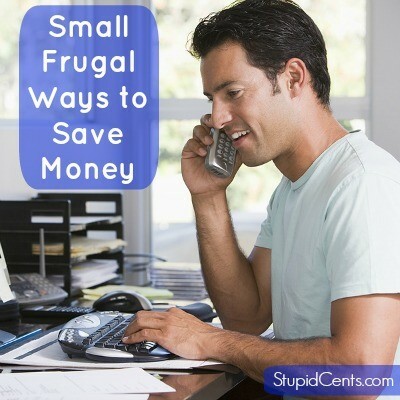 What small frugal things do you do to save money? I’m a big fan of the brown bag routine. I actually am still able to eat lunch with co-workers, as they will bring their bought lunch back to the office. I need to start ‘asking’ for discounts more often. Never hurts to ask and I feel like more often that not you might get a discount!